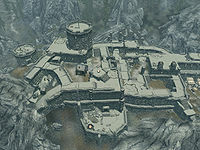 Fort Sungard is a large Forsworn occupied fort located strategically at the crossroads between the Reach, Whiterun Hold, and Falkreath Hold. The fort is on top of a small mountain, making access limited to approach from the plains of Whiterun Hold. Initially the fort will be occupied by Forsworn, but the interior of the buildings are entirely free of them, making exploration easy. The fort has a courtyard and five interior zones: Fort Sungard Muster, Fort Sungard Shrine, Fort Sungard Annex, Fort Sungard Tower, and Fort Sungard Oubliette. Although there are several stealthy and covert methods to enter the interior of this fortress, the most likely route of entrance is the exterior gate. By default, the exterior of the fortress will be teeming with Forsworn, although this will be the only location in the fort inhabited by them. The Forsworn will be replaced by soldiers of the faction currently controlling Markarth if the fort is cleared, or if The Reach changes hands during the civil war it will be automatically retaken by the new regime. The route leading up to the main gate is scattered with wooden towers and defenses, and a melee warrior can easily get overwhelmed by the Forsworn here. The next tier (middle tier) of the battlements only has two defenders, who guard the Fort Sungard Muster. The next tier of the exterior, and the highest tier, is guarded by three Forsworn. Up here there are a couple of doors to the Fort Sungard Tower and a door to the Fort Sungard Annex. There is little loot in this area of Fort Sungard, aside from a chest to the right of the fort's main gate. The Muster is largely the living and eating quarters for the fort. The bottom level makes up the sleeping area, leading into the kitchen and dining area, before ending on the lowest level in the pantry. There are three entrances into this area. The pantry exit is a small grate that allows for access between the exterior and interior of the fort's walls. The living area contains an exit to the roofs and courtyard of the Fort. There is a copy of the Smithing skill book Last Scabbard of Akrash on the highest level at the end of hall on a table with a few ingots. Other than that there are only loose foodstuffs, a stray Charred Skeever Hide in the pantry, and a Taproot in the kitchen. The Smithing skill book Last Scabbard of Akrash on the highest level at the end of the hall on a table. Several chests in the hallway on the highest level. A cooking pot in the kitchen down the stairs from the main room. The Shrine is a small area of the fort with only two rooms. The bottom room is an alchemy lab with a few stray alchemy ingredients. The top room has a shrine. If the fort is controlled by the Forsworn, the shrine is a Shrine of Kynareth; if Imperials control the fort, it is a Shrine of Akatosh; if Stormcloaks control the fort, it is a Shrine of Talos. Aside from that there is only an adept-locked strong box sitting on the hay bales. A strongbox on the haystack next to the alchemy table. A shrine on the upper floor, the shrine will be to Kynareth if Forsworn occupy the castle, Talos if the Stormcloaks are the occupiers, or Akatosh if the Imperials control the fort. An alchemy lab in the lower floor. The Annex is the armory of the fort and contains a few floors with stray armor and weapons. At the top is the entrance to the fort, going deeper descends you past a jail cell and ultimately to an officer's office and bedroom. The exit at the bottom will lead to a small smithing area on a porch that overlooks Whiterun Hold. On top of the chimney in the first room stands a bucket with a random war axe lying on it and a random potion hidden inside the bucket. Two chests in the officer's office and bedroom. A key to Fort Sungard Jail on the officer's table. A Scroll of Call to Arms under the officer's table. A forge, grindstone and workbench on the balcony that overlooks Whiterun. The Tower is a four story building with several exits to various levels of the fort. The bottom level leads to the oubliette, the second level leads to the courtyard, the third level to the fort rooftops, and the top level to the tower's roof itself. A cart on the second level has two Moonstone ores lying on it. Two moonstone ore in a cart on the second level. Two leveled potions of any variety on a table, in the room with no door on the second level. A chest next to the shelf in-between the two spiral staircases on the second level. The Oubliette is the jail tower of the fort. A ladder leads to the top of the tower and a secret exit can be found on the bottom. The cells on the main floor are empty, but on the bottom floor there is a large drop down that can potentially kill very low level players. A bandit prisoner discovered this fact when he was cast into the oubliette and was crushed by the fall. In the chamber after the large fall, next to the bandit corpse is the Pickpocket skill book Guide to Better Thieving, and a Fort Sungard Jail Key. A few lockpicks are scattered around the corpse and the locked door out of the area. A note urging the Forsworn to hasten the taking of the fort is found in the tent with the boss chest at the Serpent's Bluff Redoubt. If you open the local map at the crossroads to the east of the Fort, the area will be called "Granite Hill". Granite Hill was to be a village in Falkreath Hold that was omitted from the final game, similar to Heljarchen in the Pale. It is referenced in the game files, and also in the book Holdings of Jarl Gjalund. When exiting to the smithing balcony of the Fort Sungard Annex, your follower may get trapped there. You can fast travel with Fort Sungard as the destination to solve this. The grindstone in the annex may not be interactable. A Forsworn can be generated inside of the shrine, making it impossible to reach or kill them. This can be remedied by standing to the left of the door and casting rune spells onto the lip part of the shrine. It is impossible to regarrison the fort by clearing out the Forsworn - they will usually simply respawn. ? As you exit the Fort Sunguard Oubliette, you may encounter a group of 3 Forsworn which are not hostile, even if you havn't completed No One Escapes Cidhna Mine. If you interact with them, they will simply say greetings and other random replies. ? This page was last modified on 19 July 2018, at 05:03.